A look back at the social media king's first five years on the stock market. Feb. 1, 2017, marked five years since Facebook (NASDAQ:FB) filed its initial public offering. The ride began with lots of volatility (and significant paper losses) for early investors. But it has turned out to be a profitable trip for long-term shareholders. Facebook's stock is up 250% since the IPO, compared to an 80% rise in the broader market. The social media titan is a far different company than it was in early 2012, when management was aiming to get its "like" button splashed across the internet. Here are a few market-shattering achievements Facebook has logged since then. Facebook counted 845 million active monthly users at the beginning of 2012, which equated to a whopping 39% increase over the prior year. CEO Mark Zuckerberg and his team warned at the time of the IPO that, despite a focus on expanding the platform's reach, the social media giant's growth rate was bound to slow down. He was right -- to a point. Over the following years, user gains fell to a 25% pace in 2012, a 16% pace in 2013, and a 13% pace in 2014. Growth sped up from there, though, rising to 14% in 2015 and 17% last year. Ultimately, the company added 1 billion active users to a base it described as "vast" back in 2012. Facebook now counts 1.86 billion fans who log into their account each month, and well over 1 billion who check their feed daily. In its first year as a public company, Facebook generated $1.54 of average revenue per user across its global base, equating to $5 billion of annual sales. That ARPU metric consisted of a very high rate in the U.S. market ($4.08) and much-smaller revenue in less mature geographies like Europe ($1.71) and Asia ($0.69). Image source: Facebook investor presentation. In just five years, the progress on these figures has been amazing. Thanks to a booming advertising business, Facebook now earns nearly $20 of ARPU in the U.S. market, $6 in Europe, and $2 in the Asia region. Globally, ARPU passed $4.80 in 2016, which pushed overall revenue up to $27 billion. The move to mobile browsing presented a huge risk to Facebook's business model in 2012 since nearly all of the platform's advertising spots back then were built for PCs. "We are investing to try to make our mobile ads more valuable over time," executives assured investors. "Our success in ramping up mobile monetization will likely have a material impact on our financial performance," they predicted. Mobile advertising has jumped from 11% of the business in 2012 to 84% today. The segment spiked by 61% in the most recent quarter as users raced to their smartphones to accomplish more of their holiday shopping. In fact, mobile has become such a pillar of Facebook's business that the company next quarter plans to cease breaking out mobile numbers since "the vast majority of monthly and daily usage now occurs on mobile devices." Five years ago, Facebook's $1 billion of trailing net income made the company look richly valued at its IPO. Investors were being asked to pay more than 100 times earnings when shares were initially priced at $38 apiece. 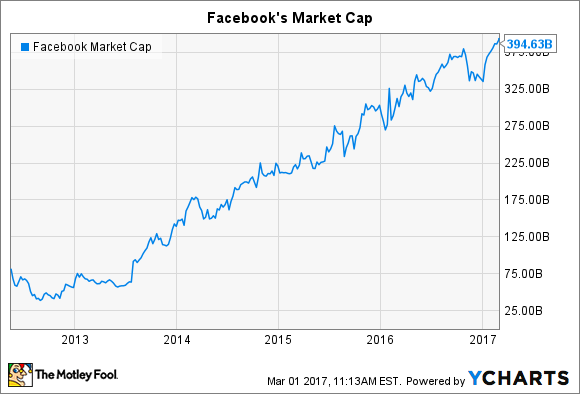 FB Market Cap data by YCharts. The price-to-earnings ratio got much worse before it improved. Facebook's first fiscal year saw earnings plummet to almost zero as executives scaled up investments in hiring a growing army of developers. Yet there's no denying that these early costs paid off. Facebook last year passed $10 billion of annual profit and, with the company approaching a market capitalization of $400 billion, the stock's P/E ratio has drifted down to below 40. The word "video" makes its first appearance in a Facebook annual report in 2012. The content category was mentioned as just one of many ways that users can connect with friends. Today, it's absolutely central to the company's operating strategy. In fact, Zuckerberg sees video sitting at "the heart of all our services." Video has been a win-win for the business since it boosts engagement with the service and improves advertising effectiveness. It's a category shift that management believes is on par with the stampede to mobile that happened just since 2013. So it's probably a safe bet that by 2022 a typical Facebook user experience will be dominated by much-richer media.